Is it OK to quit your job without another in hand? Mean boss. Unsatisfying work. Boring colleagues. You can't stand your job one more minute. And before you know it, you've handed in your resignation. That's increasingly the case for many young employees. Research shows that for the Millennial generation -- many in their 20s now and in their first real jobs -- the itch to quit comes pretty soon. In fact, 86% said that even though they know job hopping looks bad, it won't stop them from walking out the door, according to a survey from HR consulting firm RecruitFi. If you're really unhappy and want to move on, or you're ready for new challenges, by all means start looking for another job. Just don't take a rash decision. You like one part of the job -- Focus on that. Leigh McMullan Abramson had already graduated from an Ivy League law school and joined a corporate law firm before she realized she didn't really want to be a lawyer. But Abramson did enjoy one part of her job: writing. So she started making time in the mornings before work and on weekends to sit down and write, mostly essays at first. In about a year she got one piece published in The New York Times -- while she was still working at the firm. "That's when it started feeling like this wasn't a totally crazy idea, that maybe I could do this," Abramson said. She quit, but was still worried about a potential gap on her resume. She enrolled in an MFA program at Columbia University, just in case work didn't immediately come along. So she married her legal experience with her passion. Now, she's a writer for the website "Above the Law" and is working on her first novel about what else ... a law firm. You might need more money than you think. After 10 years at various hedge funds, Jon Schiff (pictured above) knew he wanted out. There were things he liked about his job, but he just wasn't passionate about derivatives trading. He'd rather open up his own juice bar. He knew it would be hard financially. So, six months before quitting, Schiff started working on a business plan and saving up. He moved to a smaller apartment, brought lunch from home daily, and cut back on travel and going out with friends. "I even thought about moving back in with my parents," Schiff said. He estimated he would need six months of savings. 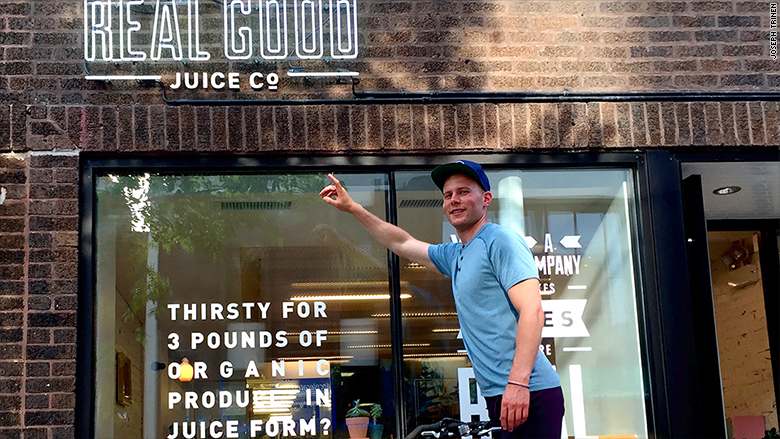 But six months went by and his idea -- Real Good Juice -- was not even up and running yet. He started to panic a bit, and sold some of his stocks to help pay the bills. It ended up taking an entire year, but now the juice bar is thriving and Schiff is about to open a second location. "It's a scary move to quit your job and everyone will tell you not to do it. But the truth of the matter is, I'd still be at my office behind a desk if I didn't. When your back is against the wall, it forces you to get creative," he said. Don't burn bridges. You'll need them sooner than you think. Your old colleagues could become your future clients. That's what Mary Lee Herrington realized soon enough. She had quit her law firm to start her own wedding planning business. It was a big change, but she realized working at a big firm just didn't fulfill her aspirations of interacting more with people. Herrington asked family and friends what they thought she was good at. They remembered how great she was at planning events and parties back in law school when she chaired the school's social committee. So she did it, but gradually. Although the hours at the firm were long, she held on until her plan was in place. "I kept in touch with former coworkers because no matter what you do in life, it's the people that you know that will help get you there," she said. And guess what? One of her first clients was referred by a former coworker. In fact, it made Herrington realize that there are aspects of the legal profession that she actually liked and could use while working with people. She used that knowledge to start a second business: a legal consultant for small business owners. Realizing you chose the wrong career for the wrong reason. "I had a crazy big salary, but I was miserable," said Liz Brown, the author of "Life After Law," a career advice book for lawyers. Brown chose to become a litigator because she knew she could make good money and everyone always said she was really good at arguing. Despite having the skill, she found out that she actually hated arguing. Brown didn't have a plan when she quit, but she did have a supportive family and savings to make the transition work. Eventually she became the manager at an angel investor network, and finally landed happily where she is now: a professor at Bentley University. Brown focused on finding out what skills she was good at and enjoyed doing. For her, that's teaching.